It’s odd. I’m about as happy as I’ve ever been. Big-city life is thrilling to me, and Seoul bigger than the biggest city in America. My wife and kids love living overseas. We’re all enjoying learning Korean, more or less. Work is tiring, but fulfilling. I have some fine colleagues and some generous friends. Church life is joyful and familiar: Presbyterian, liturgical, biblical, theological, communal, small, foodly. The kids are flourishing, my wife is wonderful, and the cherry blossoms will bloom in a couple weeks time. Things really are great. Really great. In his memoir of his spiritual journey, CS Lewis writes about occasional, unpredictable experiences that he called “stabs of joy.” He was mostly melancholic, but every once in a great while, he was deeply moved by something otherworldly and joyous, painful because freighted with longing. I, on the other hand, feel as though I am living in a world of enchantment—things are great, and I’m happy. But every so often I experience not the Lewisian stabs of joy, but rather their opposite: stabs of sorrow. I’m rather new at this. I was new to the unforeseen disappointments of leading a group of prodigals and pilgrims in a shared and local life. I was new to having my influence rendered, in many cases, surprisingly uninfluential. I was new to seeing families rent asunder up close, and I was certainly new to that peculiar sort of failure one feels when one knows that one’s help didn’t help—especially when help, it seemed, was so desperately needed. I was new to opening my heart and my life and my home to so many different people. And I was most definitely new to having many of those people close their hearts and lives and homes to me. And I’m new at the grief and melancholy that now strike unexpectedly, when the sheer awfulness of some particularly awful days in a hard season not so long ago come flooding into my consciousness. Without warning, it all comes back, but somehow stronger and more achy with the passage of time. I make my attempts to reconcile with the apparent inevitability of it all, which blunts the force of these stabs of sorrow. But even my belated ‘acceptance’ (whatever that means) of these severe providences seems to cement this season in my past and make it always retrievable. My disappointments have become memorialized now; they’re a thing of my historical record, a chapter in my unwritten memoir that gets read aloud to me involuntarily from time to time, whether I like it or not. There are books with titles like Leading With a Limp and The Wounded Healer that sound like they were probably written for punks like me; for people who find themselves—what’s the Christianese word?—humbled. I should probably read those. There are also many people I know whose present suffering makes my reflection on these stabs of sorrow, situated as they are against a backdrop of steady happiness, feel utterly unwarranted. I should probably remember this. My grief isn’t utterly overwhelming like the grief of many others. My vocational failure isn’t utterly catastrophic. But since my sorrows stab me every so often, perhaps my grief is a grief that nevertheless ought to be observed. I’m attending to these sorrows when they come upon me. Surely they have something to teach me, even though I suspect at times that the truths I’m meant to learn are ones I already know: fallenness, finitude, frailty. I take these stabs of sorrow to be indicators that my knowledge of these postlapsarian conditions needs to be deeper still. More personal. It’s not “people” who are fallen, but me. It’s not “the world” that is frail, it’s me. It’s not “creation” that is finite, but me. These stabs of sorrow are no fun, but the creatureliness they underscore is true. And a reckoning with true things, however not-fun, has got to be a good thing. As a church planter, I’ve been learning to embrace my entrepreneurial spirit. I’ve begun to unapologetically and boldly blaze a trail and cut a clearing on a missional frontier that many did not think existed. And so I’ve been reading and podcasting lots of fuel for the entrepreneurial fire that burns within. Forge ahead! That’s been the sound ringing in my ear. And yet I’ve freshly realized that I’m called not to translocal apostolicity nor to prop up a placeless e-platform. Rather, I am called to plant. Plant the gospel, plant myself. And along comes Samuel Rutherford, another ‘nonconformist’, though of the 17th-Century Scottish variety. A man out of step with his time not so much because of his passion to forge ahead to uncharted territory (though in his own way, he did that), but because of his unrelenting insistence upon diving deep. 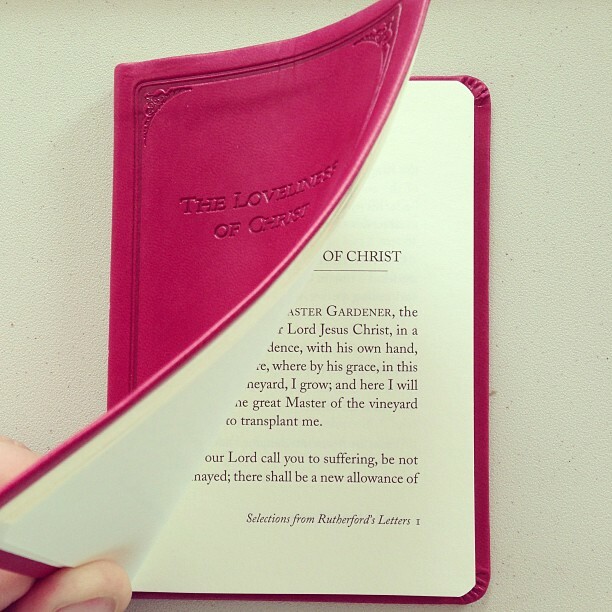 Deep into ‘the loveliness of Christ’. The deeper Rutherford dove into the loveliness of Christ, the deeper the gospel of Jesus was planted in the community to which he ministered. It is humbling to reckon with the indisputable fact that a man like Rutherford planted congregations more deeply in the gospel—without ever planting a church—than most church planters will ever do. Fellow church planters: Let us be brave and fearless. Let us be ‘entrepreneurial’ in its most sanctified sense. But let us never be so much of these noble things as to blaze a trail right past the deep, sweet well of love—the lovely Jesus himself. And let us not be so apostolic as to fail to plant a community around this well, teaching one another to draw from it every day. The Great Master Gardener, the Father of our Lord Jesus Christ, in a wonderful providence, with his own hand, planted me here, where by his grace, in this part of his vineyard, I grow; and here I will abide till the great Master of the vineyard think it fit to transplant me. Encouraging? Share this with your followers on Twitter, or get these daily posts in your email inbox. I abandoned the professional academic track after my MA in history at the University of South Carolina. I had simply not been engaging with flesh-and-blood humanity in the way I knew I was called to, and in the way I was, in fact, gifted to do. So I went into the people business of pastoral ministry, partly because my pastor, Sinclair Ferguson, told me that, despite having spent half his ministry in the seminary context, he never wanted to be a professor. In fact, he wanted never to be a professor. This gave me great encouragement to change course and re-engage in the front line ministry of the church. After all, I was a lot more of a people person than Dr. Ferguson, I reasoned. Now over 4 years into pastoral ministry, I’m realizing that I’ve spent much of the last few years reading up on technique. I’ve read all the church planting literature. I’ve read a whole mess of the leadership and entrepreneurial literature. I’ve even read Getting Things Done (see my earlier post). But I haven’t really followed Dr. Ferguson’s admonition. He told me that I ought to spend my first several years as an associate pastor reading. Don’t get bogged down in mere busy-work, he challenged me. If you have the luxury of time, read now, he said. After all, when you get to be in his stage of life and ministry, he said, you’re speaking, preaching, pastoring—constantly. And with very, very little time to prepare. Sinclair Ferguson and I at my ordination, January 11, 2009, First Associate Reformed Presbyterian Church, Rock Hill, SC. I was privileged to have him preach at my service. The early years of ministry, he suggested, should be spent, if possible, filling the theological and biblical reservoir with as much content as possible. Expand your spiritual imagination, broaden your vocabulary, and enlarge your heart now, so that when you have enormous demands on your time, your mind, and your tongue, you have ample resources to draw from. I didn’t take his advice. I regret that. Now I’m a church planter. I’m leading the musicians for two unique services every Sunday. I’m often preaching two different sermons each week. And I’m way in over my head in terms of competency for pastoral ministry. But I’m still relatively young, and, Lord willing, I have at least 32 years left of work in me. So I’m pivoting. I’m heeding his counsel. I’m reading more. I’m thinking more. I’m writing more. This rhythm, they say, is actually good for your mind, heart, and soul. And for your ministry, too. I’m encouraged to have run across this article in Themelios on the writing pastor. I hope you’ll listen to this voice, and to the voice of Dr. Ferguson. Don’t retreat into the ivory tower and disengage. But discipline your mind through reading, contemplation, and writing, so that you are more skilled to say the right thing at the right time to bless a real, flesh-and-blood person you’ve been called to minister to.